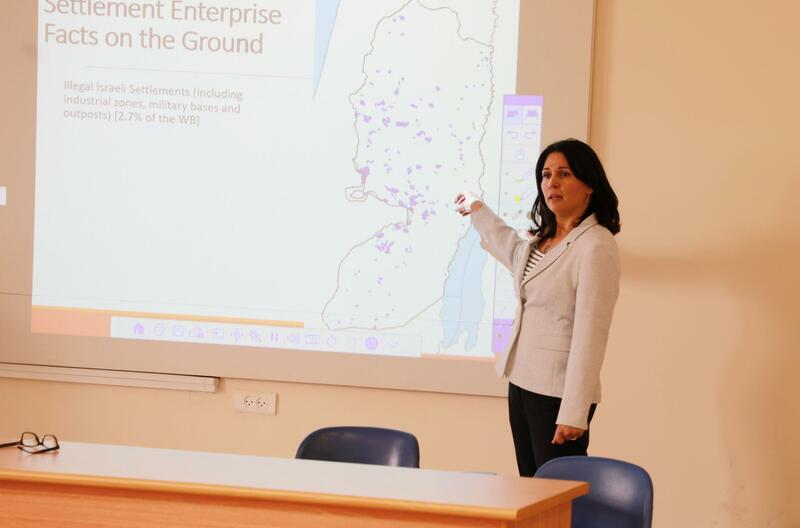 The PLO's Negotiations Affairs Department held a lecture for students at Arab American University regarding the political situation and Israel's practices to end the peace process, presented by Mrs. Fatna Al-Houdali. 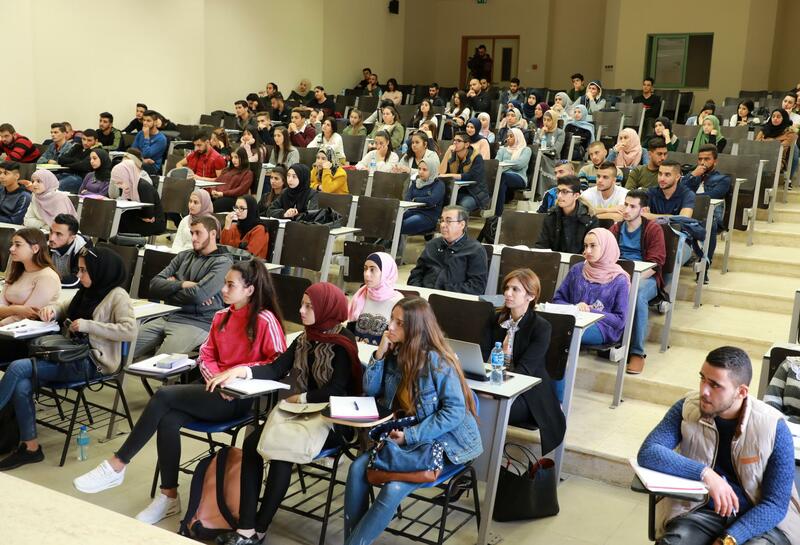 The lecture was attended by the Vice President for International Relations Dr. Dalal Irekat, and the President Assistant of Community Affairs Dr. Eyad Delbeh, and the lecturer in Public Culture Department Fadi Goumah and a large number of university students. Mrs. Houdali reviewed the stages of the peace process since Oslo convection in 1993, the phases and challenges of the peace process, and what Israel's processed during the 20 years and demographic changes in West Bank, through seizure Tens of thousands of dunums of land, and turning it to Military and settlement zones, the construction of the Apartheid Wall, the separation West Bank, and the final isolation of Jerusalem, where the cities and towns of West bank are now isolated cantons on each other. 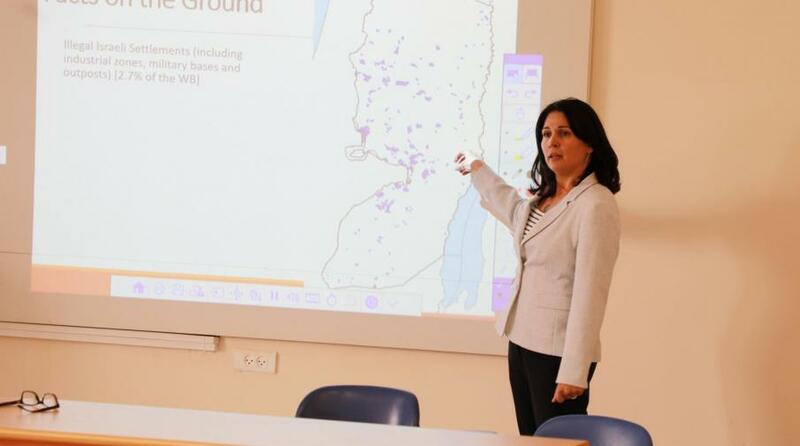 She added that the number of settlers in the West Bank reached about 650,000 and 450 settlements zones in addition to checkpoints. In contrast, the West Bank has a population of about 2 million to 900,000. She explained that Israel's changes on the ground was aimed to kill any opportunity that would lead to a comprehensive peace process and stability in the region, adding the Israeli actions was all in front of the eyes of the international community, the United Nations and the international Quartet ignoring all International conventions. As she assured that today the imposition of peace is very small because of the changes in the West Bank. To save what remains from the peace process, the international community must act immediately to dissuade Israel from all its actions, and work to remove settlements and military points. Houdali reviewed a series of detailed maps of West Bank, Jerusalem and the Gaza Strip and the change that Israel has made over the past years. At the end of the lecture, there were discussions and questions from students about the role of the Palestinian leadership in confronting Israel's actions, future scenarios, and the vision of a solution and the peace process under the current situation. The University Organizes an Introductory Lecture About "Samaritan Community"